City of Portugal. Even before its conquest by the Portuguese in 1140, it possessed a Jewry, situated near the Church of S. Ildefonso. It is now more than two centuries since this ceased to exist. The synagogue of Santarem was the oldest in all Portugal, and the city was the seat of the district rabbi, appointed by the chief rabbi for the province of Estremadura. 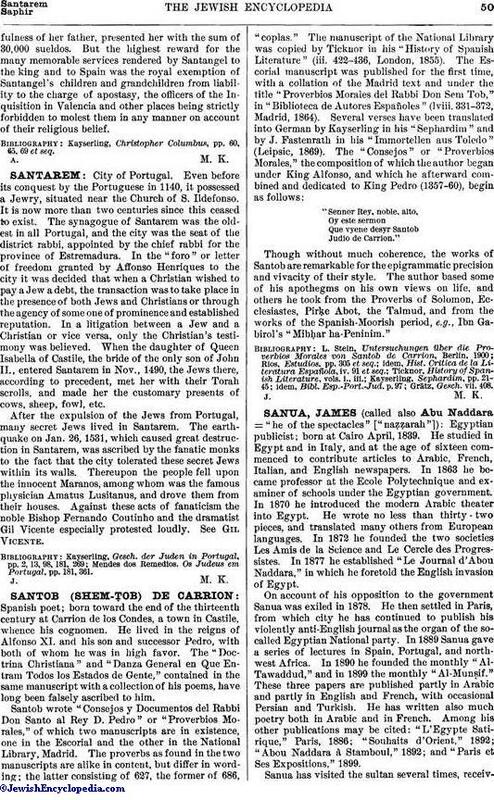 In the "foro" or letter of freedom granted by Affonso Henriques to the city it was decided that when a Christian wished to pay a Jew a debt, the transaction was to take place in the presence of both Jews and Christians or through the agency of some one of prominence and established reputation. In a litigation between a Jew and a Christian or vice versa, only the Christian's testimony was believed. When the daughter of Queen Isabella of Castile, the bride of the only son of John II., entered Santarem in Nov., 1490, the Jews there, according to precedent, met her with their Torah scrolls, and made her the customary presents of cows, sheep, fowl, etc. After the expulsion of the Jews from Portugal, many secret Jews lived in Santarem. The earthquake on Jan. 26, 1531, which caused great destruction in Santarem, was ascribed by the fanatic monks to the fact that the city tolerated these secret Jews within its walls. Thereupon the people fell upon the innocent Maranos, among whom was the famous physician Amatus Lusitanus, and drove them from their houses. Against these acts of fanaticism the noble Bishop Fernando Coutinho and the dramatist Gil Vicente especially protested loudly. See Gil Vicente. Mendes dos Remedios. Os Judeus em Portugal, pp. 181, 361.